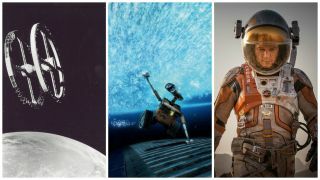 "2001: A Space Odyssey," "WALL-E," and "The Martian," are three of the best space movies of all time, according to Space.com. Movies have the power to transport audiences to incredible places — including outer space. We've rounded up what we think are the best space movies in the whole universe. For this list, we picked the best of the best — the front runners, the top contenders, the big cheeses. We've organized the list by category, so you can look for a type of movie that appeals to you. Whether you want the greatest space-based tear jerker, the most out-of-this-world action, or something wonderfully weird, there's flick here for you. But the list does have one big caveat: It does not include movies in the "Star Wars" and "Star Trek" franchises. Why? Because those movies would dominate most of the categories. So, we've created separate lists for "Star Wars" and "Star Trek." If you've already seen all the movies below and are ready for more recommendations, check out our list of strange and lesser-known space movies, handpicked by our staff. The characters Bowman and Poole from "2001: A Space Odyssey." Winner: "2001: A Space Odyssey" (1968). Often considered one of the greatest movies ever made, Stanley Kubrick's masterpiece is intense, terrifying, expansive and majestic. Taking viewers across light-years of space and eons of time, it probes deep into the nature of consciousness. The orchestral song that ends the movie, with its pounding crescendo, may be the very definition of "epic." And yet part of what makes "2001" so impressive is Kubrick's masterful use of silence and calmness — viewers will not soon forget Hal's unsettlingly cool tone when he says, "I'm sorry, Dave. I'm afraid I can't do that." There is some significant debate among fans about what this movie "means." Arthur C. Clarke, who co-wrote the script, presented his own interpretation in the book of the same name, but Kubrick insisted on never offering a single explanation. Rather than deterring viewers, this impenetrable quality of the film seems to keep people coming back, eager to try to crack the code. Runners-up: "Contact" (1997), "The Last Starfighter" (1984), "Close Encounters of the Third Kind," (1977), "Interstellar" (2014). "The Martian" (2016) takes our prize for most realistic space movie. Winner: "The Martian" (2015). When astronaut Mark Watney is accidentally left behind on Mars, he has to find a way to survive until a rescue mission can reach him. There are no aliens or giant asteroids in this tale — viewers literally watch Watney try to grow food, make water, and stabilize his artificial habitat. As dry as that description may sound to some, the movie is dramatic and action-packed, because surviving on Mars — even under the best circumstances — is really, really hard. Andy Weir, author of the book on which the movie is based on, deserves a lot of the credit for making this realistic portrayal of space exploration incredibly entertaining. Weir is also responsible for infusing the story real science, such as the ways that the low temperatures and thin atmosphere affect Watney's day-to-day life. The movie gives a fairly realistic depiction of the amount of time and incredible effort it takes to build and launch a probe to another planet. To top it all off, we love that this movie doesn't make space the enemy: Even as Mars continues to nearly kill Watney, the characters never lose their passion for exploration, and that's a reality that's missing from many space movies. Winner: "District 9" (2009). There's a running theme in the work of director Neill Blomkamp: Will the future be utopian, or will it be dominated by humanity's worst qualities? In "District 9," Blomkamp questions how humans would behave if they ever encountered an advanced alien civilization. When a spaceship breaks down in the sky above South Africa, Earth's political leaders scramble for the chance to steal the weapons technology on board. The alien passengers become hostages, despised by most of the humans around them and forced to live in resource-poor slums. The film draws parallels to the treatment of blacks during Apartheid, but comparisons can also be made with the treatment of "illegal aliens" in countries like the United States today. "District 9" makes some fascinating choices in order to challenge the notion of "us vs. them," and questions whether humans could ever treat aliens with civility, considering how much we struggle to live peacefully with one another. Runners-up: "Moon" (2009), "Silent Running" (1972). WALL-E the robot will turn on your tear glands. Winner: "WALL-E" (2008). If we had a category for "Most Adorable Robot," this movie would have very few rivals. But that's not the only reason "WALL-E" activates our tear glands: It is also a highly emotional story about what gets lost when people stop taking responsibility for their actions. The movie tells the story of a lonely robot who finally finds someone he can connect with, only to have her stolen away. His mission to find her ends up giving the entire human race a chance at redemption. "WALL-E" is full of amazing moments, like the incredible dance that EVE and WALL-E do through the stars. The more tear-prone members of the audience will likely need a box of tissues for the entire last 15 minutes of the movie. Runners-up: "E.T. : The Extra Terrestrial" (1982), "The Iron Giant" (1999), "Starman" (1984). Winner: "Alien" (1979). It's the film that coined the phrase, "In space, no one can hear you scream." "Alien" is another space movie that transcends the genre: It's quite simply one of the most terrifying movies ever made. A crew of space explorers finds that their ship has been infested by an alien species that gestates its offspring inside a human host. The film takes the classic horror-movie element of isolation to a whole new level: The characters aren't in the woods or even Antarctica — they're in space, and help is millions of miles away. The insect-like aliens, designed by H.R. Giger and operated by Bolaji Badejo, are now a cultural icon, but in the original film, the terror comes largely from how little they emerge from the darkness of the ship. No other alien movie comes close to this one — except, perhaps, the sequel. Runners-up: "Aliens" (1986), "Planet of the Vampires" (1965), "Event Horizon" (1997), "Europa Report" (2013). Also, check out our complete list of "Scariest Space Movies." An unlikely team of outlaws join forces in "Guardians of the Galaxy." Winner: "Guardians of the Galaxy" (2014). Comic book movies are all the rage right now, and "Guardians of the Galaxy" may go down as one of the best entries in the genre. The fantastic script used humor to build up the five main characters, and placed them in some truly stunning space settings. The story follows a group of five misfits who join forces after they break out of prison together. (Just take a look at the escape sequence to understand why this movie wins for best action). The group consists of the human Peter Quill, the human-like aliens Gamora and Drax, the tree-person Groot and the genetically engineered raccoon Rocket. While the escaped convicts are initially focused on their own pursuits, the group eventually unites in order to keep a powerful artifact away from an evil warlord. "Guardians of the Galaxy" has enough spaceships, space battles, space chases and space fights to satisfy any action fan. Runners-up: "Starship Troopers" (1997), "Serenity" (2005), "Total Recall" (1990), "Independence Day" (1996). Winner: "The Fifth Element" (1997). The aliens! The costumes! The hair! Chris Tucker! This action-packed space opera (like, there's literally an alien singing techno-opera at one point) is so totally strange and surreal, it's hard not to go along for the ride. The movie's main character is Korben Dallas (played by Bruce Willis as a flying-Taxi driver), but it is the humanoid Leeloo (Milla Jovovich) who moves the story emotionally. The script features a somewhat complicated science fiction plot involving an evil alien race, the end of the universe, and an underdog attempt to save everyone. Also a strong contender for "Our Favorite Aliens," this movie is a ridiculously enthusiastic and wonderfully weird space flick. Runners up: "The Man Who Fell to Earth" (1976), "Life Force" (1985), "Dark Star" (1974), "Iron Sky" (2012). Winner: "Galaxy Quest" (1999). Since its release in 1999, "Galaxy Quest" has maintained a healthy following of fans who recognize it as a smart satire that managed to poke fun at science fiction TV shows like "Star Trek" while simultaneously giving a nod to those shows' lovability. (It's also noteworthy that the movie is accessible and funny to people who aren't necessarily familiar with "Star Trek" and similar TV shows.) The movie centers on the cast of a beloved and long-ago-canceled TV show called "Galaxy Quest," that bears more than a little resemblance to "Star Trek." Most of the actors are known for little else, and live off the glory of this past accomplishment. But when a real group of aliens called the Thermians picks up a broadcast of the show, they take it for reality and seek out the actors to save them from an encroaching enemy. Suddenly, the show's actors are forced to become the people they played on TV. The movie builds up real sentiment for the stupid but earnest Thermians, and creates a hilarious environment in which to explore the degree to which we let fiction blend into reality. Runners-up: "Spaceballs" (1987), "Mars Attacks!" (1996). A scene from the classic science fiction movie "Forbidden Planet" (1956). Winner: "Forbidden Planet" (1956). Directed by Fred M. Wilcox and starring Leslie Neilson (long before he became known for mostly comedic roles), "Forbidden Planet" was a game changer in the realm of space movies. It featured a plot that is strikingly similar to that of Shakespeare's "The Tempest," about a group of space travelers in a faster-than-light ship, who go on a mission to discover the fate of another ship that disappeared 20 years earlier. They arrive at the "forbidden planet," and are given an ominous warning by Dr. Morbius, who lives on the planet with his daughter, Altaira. The crew lands despite Morbius' objections, but soon discovers that the doctor and Altaira aren't the planet's only inhabitants. The movie includes some hard science-fiction elements, such as the interstellar ship, a sentient robot servant and an incredible machine left behind by an ancient alien civilization. "Forbidden Planet" takes a classic Shakespearean tale and sets it in the dark depths of unexplored space. In the spirit of classic science fiction, it is as much about technology and exploration as it is about the depths of the human psyche. Runners up: "This Island Earth" (1955), "Planet of the Vampires" (1965), "The Day the Earth Stood Still" (1951). Winner: "In the Shadow of the Moon" (2007). While many people today remember the Apollo program as an overwhelming success, "In the Shadow of the Moon" documents the struggles, missteps, tragedies and, ultimately, the triumphs of NASA's moon program. Like many of the films on this list, "In the Shadow of the Moon" transcends the "space" genre; it is simply an incredible documentary. It features interviews with 10 of the 12 astronauts who eventually went to the moon as part of the Apollo program, as well as a wealth of gorgeous historical footage. Where the movie truly excels is in its ability to capture the emotions of the people who lived this incredible story. The astronauts discuss the heart-wrenching loss of three colleagues in a fire in the Apollo 1 crew capsule during a launch test. They talk about what it was like to pursue their out-of-this-world goal while many of their old friends from the military fought in the Vietnam War. And, of course, they discuss the thrill of setting foot on the surface of another world. The incredible scoring and captivating storytelling capture the childlike excitement the astronauts must have felt as they explored the lunar surface. The film was directed by David Sington and Christopher Riley, and shares its name with a book by Colin Burgess and Francis French (University of Nebraska Press, 2007). Runners up: "The Dream is Alive" (1985), "Hubble 3D" (2010), "Powers of Ten" (1977), "Last Man on the Moon" (2016). Winner: "Men in Black" (1997). It was extremely difficult to choose a winner in this category, because there are so many variables to consider. Some movies get points for trying to achieve a sense of "realism" with the way their aliens look and behave. (Examples: "Europa Report" (2013) and "Monsters" (2010) try to make their aliens seems biologically complex, and draw comparisons to the discovery of new life forms on Earth; in some ways, so do "Aliens" and "District 9.") On the other hand, sometimes the best aliens are those that are completely fantastic, with no grounding in Earth-based biology. (Examples: "The Thing" (1982), "The Fifth Element" (1997) and the "Star Wars" movies more or less abandon a "realistic" approach in favor of letting the designers' creativity run wild.) Some of our favorite aliens are totally terrifying ("Alien"), while others are completely lovable ("E.T."). And some of the best movie aliens are those the audience sees very little of (the ending scenes in "Close Encounters of the Third Kind" are particularly potent because of how elusive the aliens are throughout the rest of the movie). Ultimately, we thought "Men in Black" should take home the title. The story follows a government agency created in secret to police a sizeable population of aliens that live on Earth, but who are passing as humans so as not to upset the general population. The movie contains a wide and creative range of fictional alien species, created using a great mixture of computer graphics and physical costumes. The film is light hearted in tone — it never gets too serious about the idea that aliens live among us and almost no one knows about it. There's just a touch of self-awareness that makes it possible for the movie to give a nod to the alien movies and TV shows that came before it, acknowledging that however "unrealistic" movie aliens may be, it's extremely fun to dream about the different lifeforms that might exist somewhere out there. Don't agree with our choices? Let us know! The quality of a movie comes down to personal opinion (unlike rocket science).